A University of London researcher has found something we didn’t even know we were looking for: the most iconic song ever written. After announcing his choice, he was moved to an undisclosed location. If the comment sections are any indication, a lot of the complaints are due to a misunderstanding about the researcher’s claim. He didn’t claim to have found the best song, or the most powerful, moving, or effective one. Dr. Mick Grierson was looking for the most iconic. To qualify as iconic, he says, a song has to be well-known and distinctive. If it’s famous but very similar to a lot of others, it isn’t distinctive, so it can’t really be iconic. And a very distinctive song still isn’t iconic if few people have ever heard it. It might be to you, but not to the culture at large. Even understanding that, I was mystified by the result — until I discovered something hiding in plain sight. He also looked at something he called “spectral flux,” which he said is “how the power of a note from one to the next varies.” I’m not sure what he means by that, but I’m guessing it has to do with variation in tone color and intensity. Another variable called “tonic dissonance” apparently refers to the use of pitches outside of the key, i.e. non-harmonic tones. So what he wanted was a song that was famous but departed from the norm in a number of these quantifiable ways. A minor key would count as departure, as would unusual tempo or length, or greater than average number of chord changes, or frequent changes of timbre, or a lot of pitches outside of the key. So what song did he and his computer decide is the most iconic of all time? 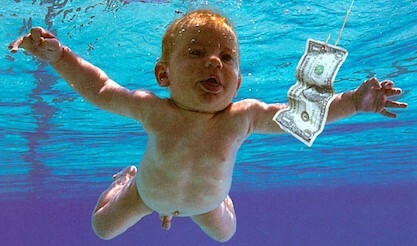 Nirvana’s 1991 hit Smells Like Teen Spirit. I’m not one to howl when the particular headbanger anthem that got me through puberty doesn’t make somebody’s Top Ten list. I’m on the side of truth and justice for this one, no skin in the game. In fact, I really like Teen Spirit, especially the way the melody leans into unexpected pitches, and that contrast between quiet lethargy and full-throated entitlement. More emblematic of a generational moment than most songs making that claim. I can even see it in the top 50 iconics, why not. But by the study’s own stated variables — not just my preferences — I couldn’t understand how it qualified as Most Iconic. Let’s compare Teen Spirit to two other songs that were lower on the list. Most of the top 50 are in a major key, and Teen Spirit is minor. One point for iconic. The tempo is 116 beats a minute, close to the average of 125. The length is 4:35, just over the average of 4:00. Two points for typical. Harmonic diversity is slim. Aside from the kind of silly 4-bar bridges at 1:23 and 2:38, the whole song appears to be the same four chords in the same order: F minor, Bb, Ab, and Db. Hey wait a sec: they aren’t even chords. Chords have at least three pitches. These are something guitarists call “power chords,” a rock staple (i.e. “not iconic”) that removes the third from every chord. So instead of F-Ab-C, it’s just F-C, and so on. It’s a really powerful, raw sound, but it reduces the already poor pitch diversity even further. If we take out the little 4-bar bridges — a total of 16 seconds — Teen Spirit doesn’t have even one pitch outside of the key, which is pretty low tonic dissonance. Include the bridges and it has just two such pitches. Variation in timbre is there, but moderate. An effective toggle of atmospheres between the mumble and shout sections, but it’s still drums and guitars from start to finish. I love the song, and it’s Top 50 iconic. But not #1. Despite a minor key, a distinctive harmonic language, a rhapsodic structure, and an 8-minute duration (for which I and all other teenage slow-dancers of the 70s and 80s are grateful), this iconic rock song came in 15th. Within seven seconds, Stairway has already exceeded Teen Spirit in harmonic variety. It starts with a progression of five different chords over that (yes) iconic chromatic bassline, including an augmented triad and a major-major 7th chord on VI. Tempo structure is also unique. It starts at 76 beats a minute, way off the average. When the drums enter for the first time at 4:19…well, first of all you say, “No drums for four minutes and 19 seconds! How iconic!” Then the tempo picks up a click to 84. Around 6 minutes, it goes up to 96. It’s a nice effect, a slight acceleration over time that helps sustain the long form. As for tone color, dynamics, and other “spectral” aspects, Stairway moves through multiple sections, from acoustic guitar and a consort of recorders (iconic!) to electric guitars and a shout chorus before ending in a quiet solo a cappella. Finally: Did the researcher even try making out to Smells Like Teen Spirit? You’d end up on a pile of bloody teeth. Stairway for the win. For pure iconic differentness, it’s Bohemian Rhapsody in a walk. A six-part rhapsody form moves from a cappella ballad to Gilbert and Sullivan operetta to hard rock and back to ballad, changing key at every gate. But we don’t even have to look that far to beat Teen Spirit. In the introduction alone, Rhapsody has nine different chords, including an added sixth chord (0:05), a secondary dominant 7th (0:09), chromatic neighbor chords (0:37), and a fully-diminished secondary leading tone 7th chord (0:47). AND it changes key after just 25 seconds. Talk about awesome tonic dissonance –all that, and all 12 notes of the chromatic scale, and we’re less than one minute in. Still, that’s only eight notes out of 12. We’re still missing Gb, G, B and D.
and Smells Like Teen Spirit has 11 of the 12 chromatic pitches, including a constant saturation of those two pitches outside of the key. But here’s the thing: Except for the vocal G, they just aren’t significant. Unlike Bohemian Rhapsody, for example, the unusual pitches are mostly incidental — a passing tone on a weak beat. No matter how often it happens, it isn’t significant enough to raise a song to iconic status. Our brains can sort between significant pitches and incidental ones. But to a computer counting the frequency of frequencies, it’s all the same. That’s why Smells Like Teen Spirit is the #1 most iconic song among Dell Inspirons.